Dr. Young received his Bachelor of Science degree in Biology from the University of Hawaii at Manoa and his Doctor of Optometry degree from Pennsylvania College of Optometry. In 1983 he completed his externship quarter at Brooke Army Medical Center and in 1984 he served as student volunteer to Student Optometric Service to Haiti. 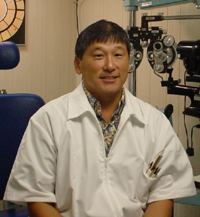 Dr. Young began his Optometric practice in Hawaii in 1985. Dr. Young is a past president of the Hawaii Optometric Association, and has served on the convention and legislative committees. He is certified to provide therapeutic pharmaceutical agents and is a LASIK panel doctor with the Laser Eye Center of Hawaii. Dr. Young served as the 2009 President of the Great Western Council of Optometry, an 11-state western optometric alliance which includes California, Oregon, Washington, Arizona, Idaho, Wyoming, Montana, Utah, Nevada, and Alaska. In recent years, the great states of Colorado and New Mexico have also joined GWCO as member states! He enjoys spending time with his wife, Eva and their daughter, Emily. Hobbies include tennis, walking, gardening, raising fish and traveling. He is currently volunteering on the Children & Youth Day planning committee (donations), Treasurer of the Kiwanis Club of Honolulu (community service organization focusing on youth), and a Neighborhood Security Watch Block Captain.